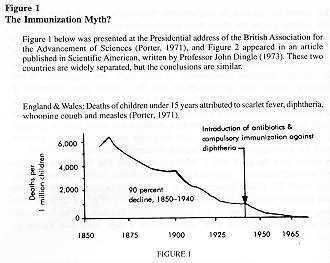 More mortality graphs Smallpox Polio Safe? Measles vaccine was introduced in 1963 in the United States. In the 1950's about 4 million children were born per year. In 1957 the number of children who died with measles was about 93 or 94. Children may die "with measles" but not "from measles". The use of fever suppressing compounds, like aspirin, raise the death rate "with measles". The actual cause of death falls under 3 causes: filth, malnutrition and mistreatment. Regarding nutrition, "...when patients with measles are given vitamin A supplements, their complication rates and chances of dying are significantly reduced." Pg 27 of VACCINES Are They Really Safe & Effective? Edition 2 by Neil Z. Miller. 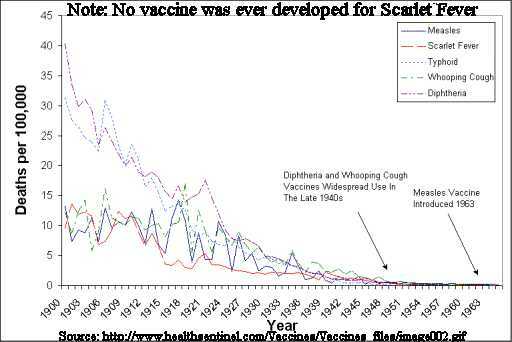 Note: the great decline in death incidence from each disease prior to the vaccine introduction. Go back and look at each mortality graph and note that there are no significant changes in the decline rate after vaccination compared to before.